You can see to the left an actual view of a website, shown on an iPhone, that’s well ranked and I’d imagine well frequented, but as you can see their mobile view is not optimized. • Scrolls bars appear and users are required to scroll back and forth to read anything. • No key information whatsoever is on the actual screen – all we see is a piece of pizza. 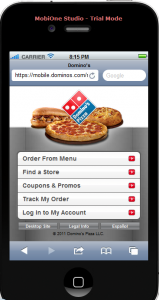 Now let’s look at another popular pizza restaurant and see how they handle their mobile visitors. That’s so much better isn’t it? •Smaller picture which leaves space for all the important information. • Scrolls bars are gone and that allows readers to view content without scrolling back and forth. • Only the most important information is presented on the opening screen which allows users to get to the point quicker. 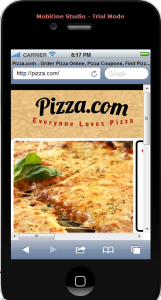 • The browser auto directs to the mobile version of the site when it detects a mobile user. Now, if you were really hungry for pizza? Which one of these sites would you like to use? Speed and ease of use play a huge part in our daily lives and purchasing goods and services are no exception. The generation of mobile surfers are not interested in waiting for pages to load and they most certainly have no time to scroll around looking for what to buy. Would you turn away seventy-one percent of potential customers? That’s really what this boils down to. But what about advertising the site very cheaply?